Ghalib (1797-1869) is generally considered to be the greatest poet of the Urdu language along with Mir who preceded him. Widely known and of quoted his ghazals sometimes appear difficult and inaccessible to those whose mother tongue is not Urdu. Attempts have been made to translate his ghazals into English Roman & Devanagri Scripts Devanagri Script has been added to the present translation. After school days in Dehra Dun and Mussoorie at the foot of the Himalayas followed by medical studies in New Delhi and some years of Medical work, the translator of these poems received a French Government scholarship for further medical research in immunobiology with the INSERM the French Medical Research organization. Since her retirement she has returned to her literary preoccupations. Her translation into English of 100 poems of Faiz Ahmed Faiz (1911-1984) which appeared in 2002 was well received at a special evening of the India international Centre New Delhi. Her Complete translation of the Diwan-e-Ghalib (1797-1869) was published by the Ghalib Institute New Delhi in 2003 and is the first of its kind. It is still very much in demand. By her translations Sarvat Rahman wishes to make known the humanistic and liberal ideas inspired by Sufism in Particular which were and are the heritage which we have received from the great poets of the Urdu language. India has a very large publics who appreciates the Urdu Ghazal even without knowing the language properly. The English translation was meant for this immense public. Having lived for so long in France the author of the French translation wished to make available this poetry to the French public also. The question was once asked, what did the Mughal dynasty which ruled over India for so long leave behind? The answer was the Taj Mahal the Urdu language and the Diwan-e-ghalib. A Diwan means the collected works of a poet. 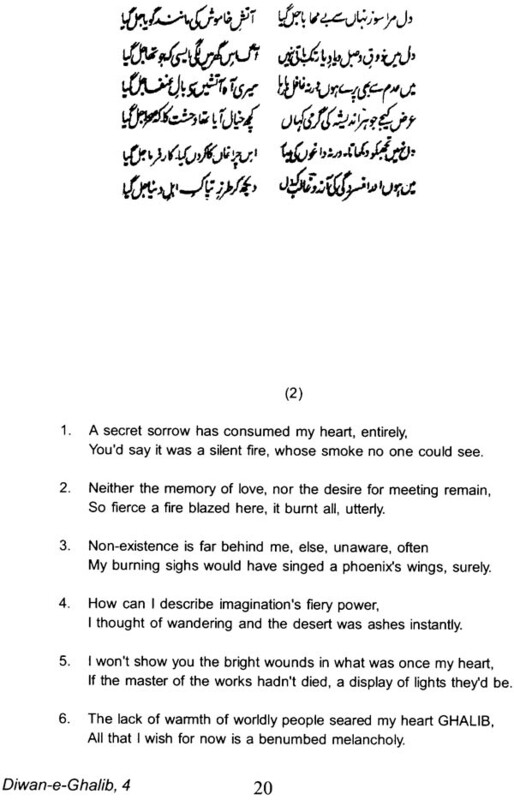 The poetic forms adopted in Urdu are several such as the ghazal the masnavi the qasida the quita etc. of these the most popular is the Ghazal. 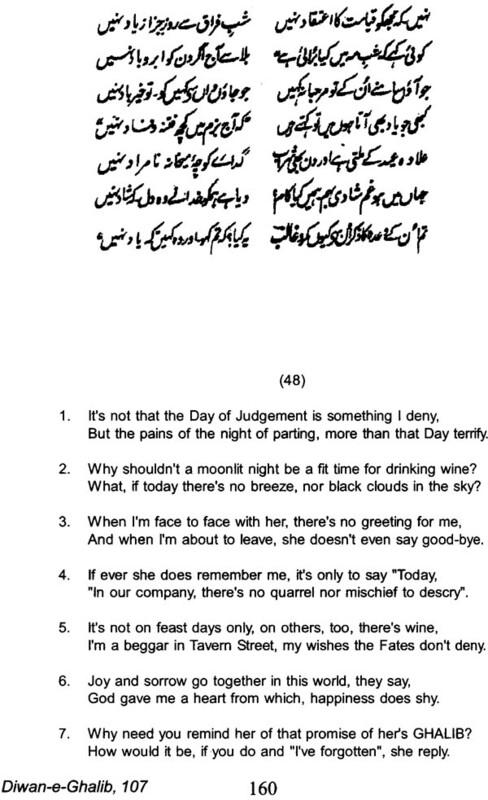 The word ghazal means literally a conversation with women. But this original meaning was deflected in the Sufi tradition to mean a search for the divine. It could well have been the other way round. 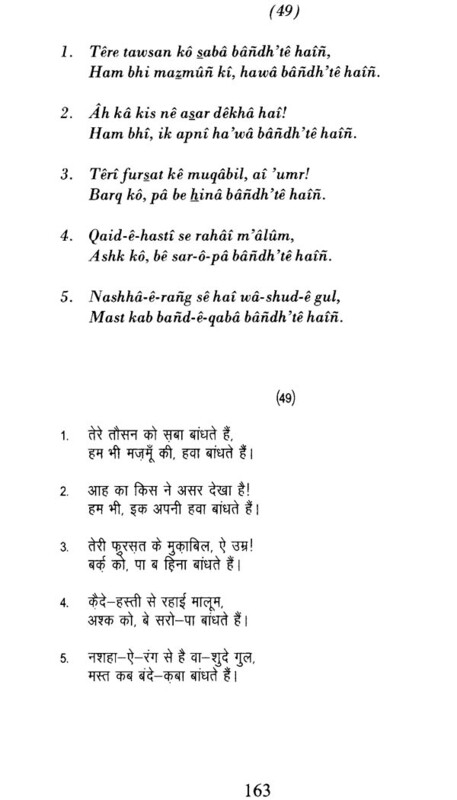 Indeed a verse of a ghazal can be interpreted in two ways Haqiqi and Majazi Haqiqi means where the thoughts of the poet and directed towards the divinity whilst Majazi indicates a preoccupation with human things. A verse may well and often does have both connotations and it is the tonality of the verse which decides this. In the Sufi conception the divinity is envisaged as feminine and as an object of intense love and the human soul is forever in search of this divinity seeking to unite itself with it. This indeed is the aim of human life. The nirvana sought for in Buddhist and Hindu faiths is somewhat similar but does not have the passionate connotation of the search for the Sufi Divinity. 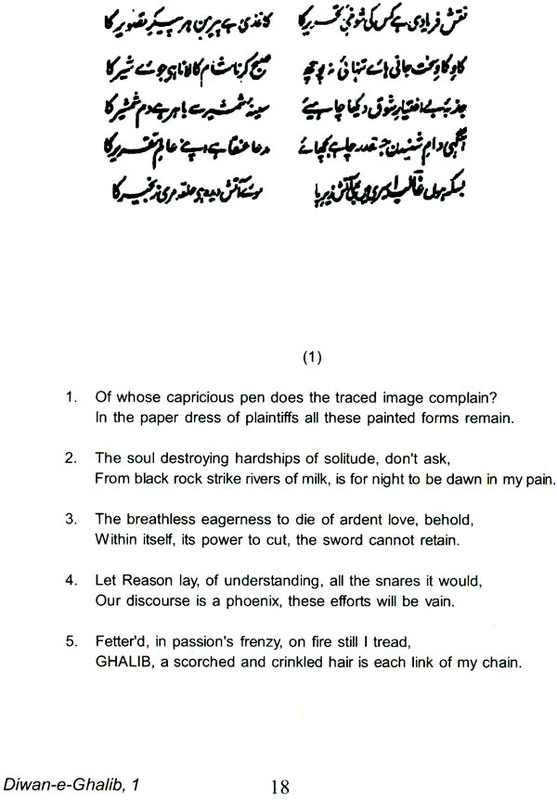 Of all the poets writing in Urdu Mirza Ghalib (1797-1869) may be said to be the most famous. Born in Agra he was married at an early age to someone slightly older to him. He then came to Delhi where the stayed with his in laws. He loved his city of Delhi which he never abandoned even during the horrors of its destruction by the British in 1857. Delhi was then Vandalized the main constructions of the Red Fort demolished and the Yamna canal which ran by it through the heart of the city destroyed. The rich palaces with extensive gardens the city’s haveli’s with their fountains and interior gardens all disappeared. The population was sent out of the city for two years to fend for itself whilst the victors looted the city. 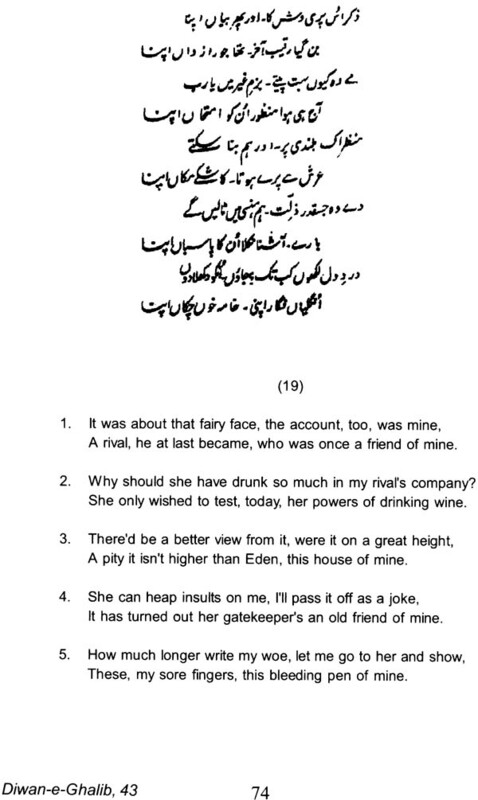 Ghalib stayed back to witness all this and even wrote about it. He loved his city of Delhi. In the eastern tradition no ruler was worth his name who did not surround himself with a bevy of court poets. This royal patronage down the centuries nourished a long poetic tradition. When dynasties fell and court patronage disappered poets had a difficult time and had to seek another patron. Thus after the fall of Delhi many poets went to Lucknow. 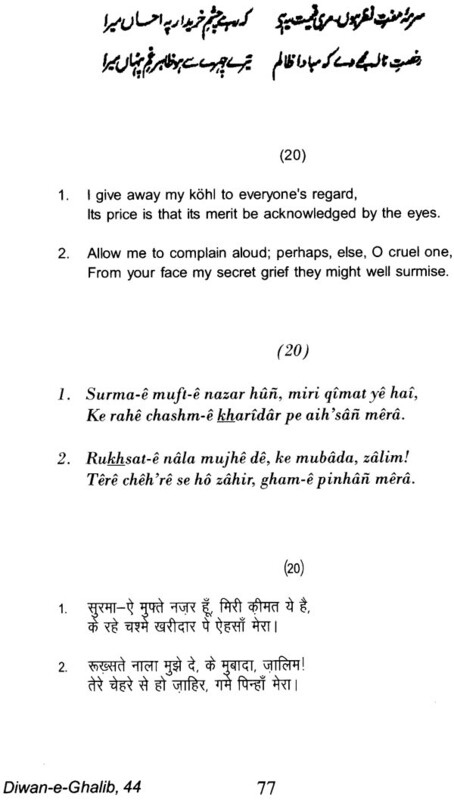 Earlier Mir Taqi MIR (1722-1810) too had to go away to Lucknow for lack of patronage. He died there poor and obscure. His tomb was removed by the British to make a railway station. 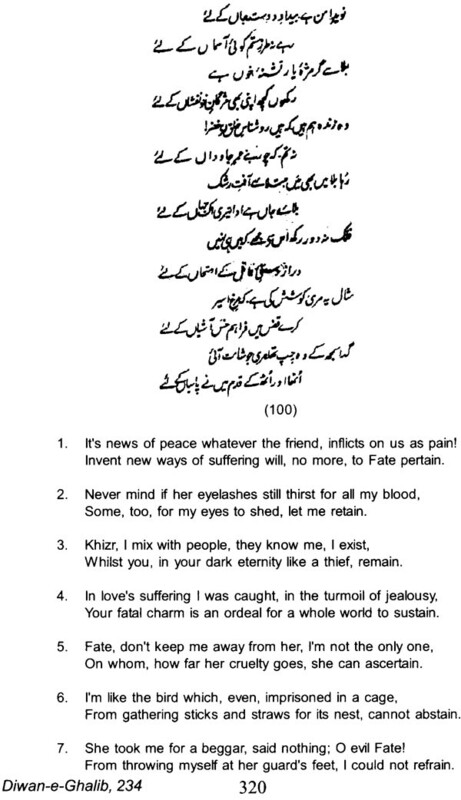 By common consent Mirza Asad Ullah-Khan Ghalib (1797-1869) is acknowledged as the greatest of the Urdu poets along with Mir. Mir belonged to the 18th century whereas Ghalib was the poet of Delhi during the 19th century. 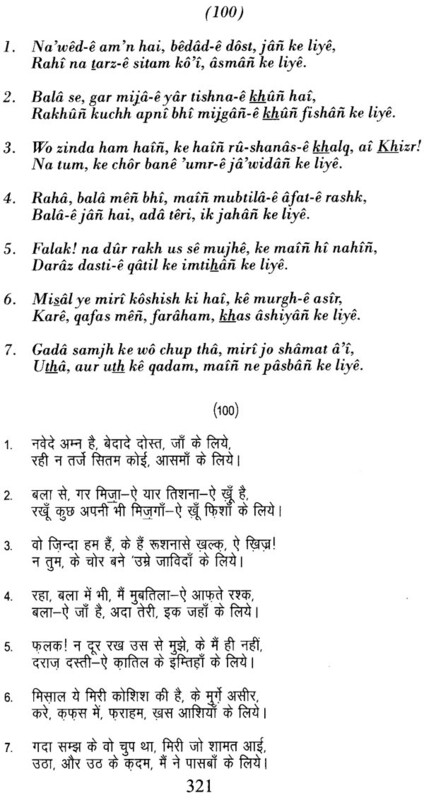 The language of Mir, who was the great defender of poetry written in Urdu as opposed to Persian now seems to contain some delicious archaisms that of Ghalib brings us to the highest point of written in modern Urdu. 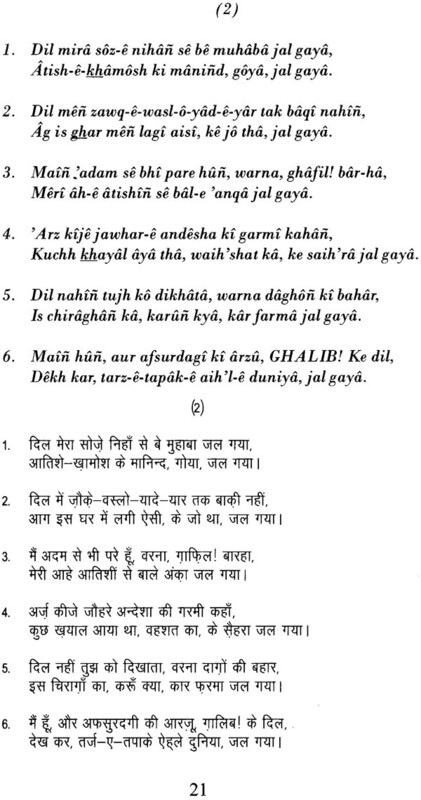 In the 19th century Urdu was the predominating language in Delhi Ghalib was the best loved though one among the many poets of the city. Ghalib’s ghazals are indeed unforgettable and modern India where Urdu no longer has a leading place continues to celebrate this poet in all possible ways. 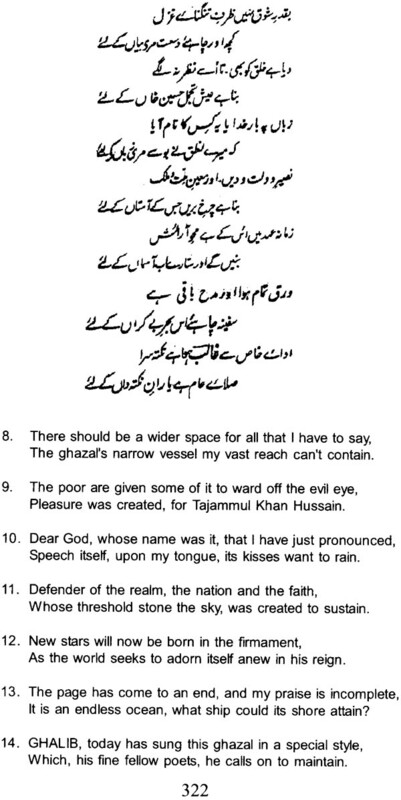 His poems are read recited and remembered. Films are made and theatre groups put up plays about him. The name of Tom Alter here comes to mind. Ghalib shows himself to be not only a consummate creator of the Ghazal that is conversation with women which the word means etymologically. His interests were wide ranging his mind catholic. He is a humanist first and foremost and all that concerns humanity is his concern. Living tow centuries earlier than us his mind is free of the preoccupation with color, creed, caste etc. which beset us today. Entering the mind of the poet of two centuries ago takes us far ahead of what is now happening in India. This freedom of thought and the beauty of the language in which it is expressed is the basis of his lasting popularity. This selection of his ghazals is directed towards a younger generation who may not know Urdu too well. Hence a glossary is given and out script of phonetic roman derived from Devnagri used so that the reader reads Urdu without having to learn its script said to be complicated. 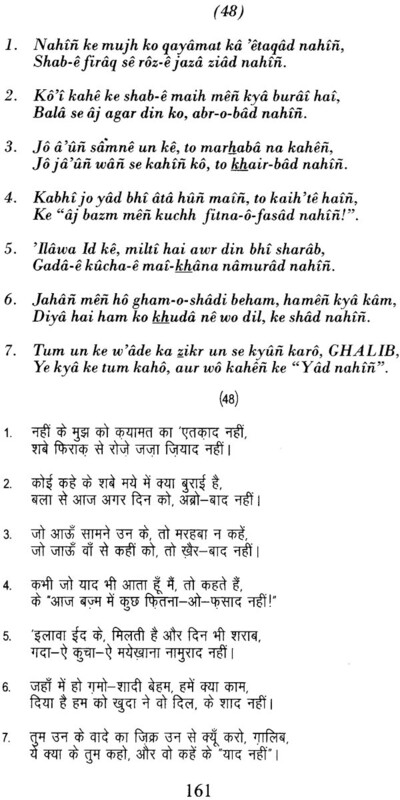 The 100 Ghazals presented herein are taken from the complete translation of the Diwan-E-Ghalib into English by this author and published by the Ghalib institute Delhi in 2003. this publication was accompanied by an introduction to the poetry of Ghalib by the same author which is still extant. 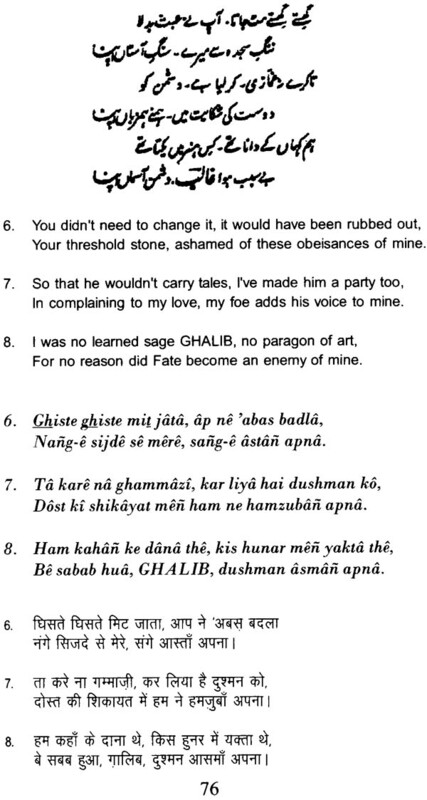 Younger readers could usefully consult this introduction for a further understanding of Ghalib’s work. UBS PUBLISHERS DISTRIBUTORS PVT. LTD.